In 1926 the Pathé company in France launched a new 17.5mm size, presumably as a competitor to 16mm, as their smaller 9.5mm gauge had already begun to sell rather well. 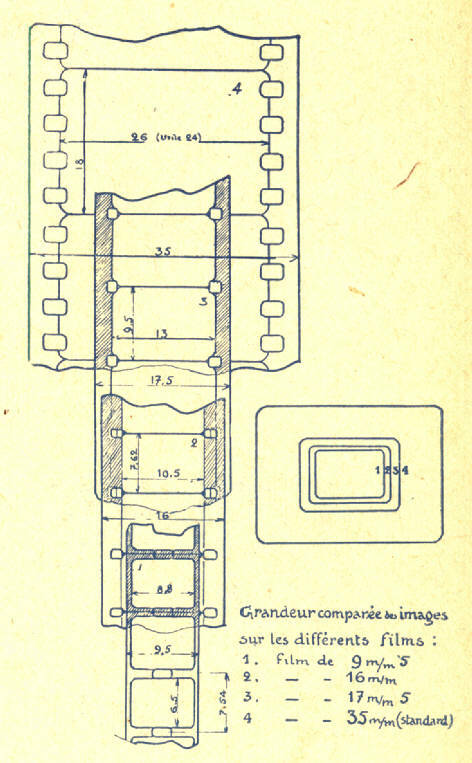 The new Pathé 17.5mm gauge, launched as the "Rural" in France, used safety stock with a picture size of * 9mm x 12mm, and was shown at the Société Français de Photographie on 10 February 1926. Printed films were produced by printing in pairs on specially perforated 35mm safety stock by reduction from 35mm originals. It seems in France the size was intended for use in the smaller country district (hence 'Rural') cinemas on the Pathé circuit. Marketing in France began in earnest in 1927, but problems with equipment and film production, together with obtaining film distribution rights slowed business. However by 1932 Pathé were claiming that over 2000 French cinemas were equiped with 17.5mm. 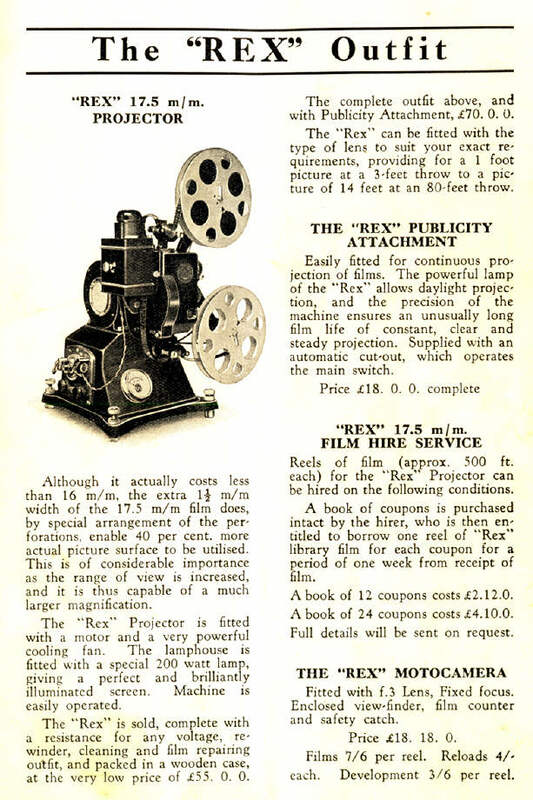 The 17.5mm silent gauge seems to have been first mentioned in the UK in the April 1932 Pathéscope Monthly, when the French made silent projector and camera were advertised using the name of "Rex". 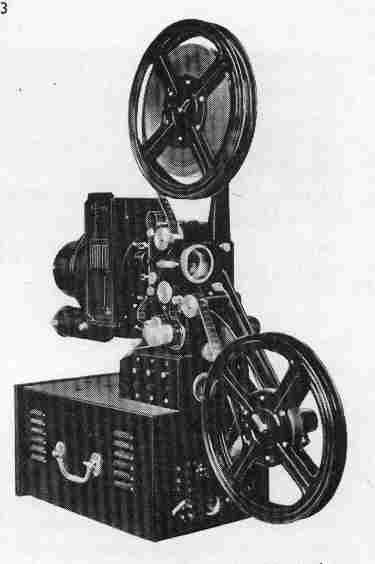 The first 17.5mm projector launched by the Pathé company in France was the silent Pathé Rural (1927) - designed for heavy use, made from castings and with replaceable components. It took spools up to 200metres / 600 feet and the 200 watt lighting was claimed to be suitable for shows of up to 200 to 300 people. 17.5mm films were circulated to the smaller communities by Pathé as a complete programme usually with newsreel, documentary and feature film. 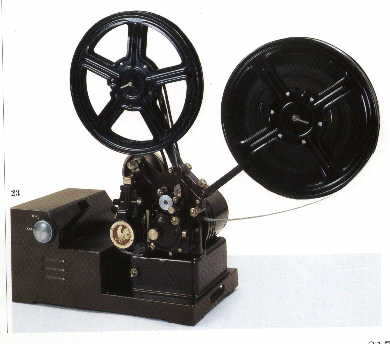 In the UK the silent 17.5mm system was hardly advertised at all by the UK company Pathéscope, when they launched the French made projector as the Pathescope "Rex", to sell at £55. A small library of 17.5mm silent films was offered (probably printed in France by Pathé for UK Pathéscope) - see separate page for the list. 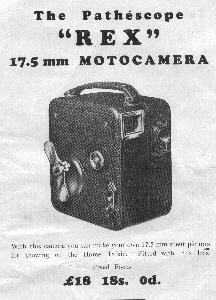 By around 1930 a cinecamera had also been launched - in France known just as the Pathé 17.5mm motocamera; in the UK it was eventually advertised as the "Rex". Effectively it was an overgrown Pathé 9.5mm motocamera, using an enlarged 'P' style charger although the film was taken up inside on a little spool. It had spring drive running at 16fps, a fixed focus lens, (on my example a Krauss Trianar f3), direct vision viewfinder and film counter (up to 9metres). Few were sold, mine has a serial number of 657B. Only one or two examples seem to exist in the UK today, in France these cameras are a little more plentiful, but beware - many have been converted to 16mm. Here is my own example - judging by the instruction card inside in French, this probably was used in France originally. There is the fixed focus Krauss Trianar f3 lens, the film counter is at the rear by the viewfinder aperture. It still has an original film charger, loaded with filmstock - no doubt rather outdated by now! It looks just like a large size Pathé 9.5mm motocamera, - the charger exactly like a fatter "P" type 9.5mm one, although the film takes up onto a small spool inside. After the mention in the 1934 Pathéscope catalogue shown above, and the 1938 catalogue shown below, there seems virtually no mention of filming on 17.5mm. Presumably filmstock was still supplied for those with the 'Rex' cinecamera, I guess Pathéscope imported the filmstock from France - maybe they sent it back there for processing? Glancing through 1930s cine magazines, I have just spotted the only cine magazine reference so far, to 17.5mm filming. Shown below (this company certainly had a 17.5mm film library), we see at least one shop was stocking 17.5m camera film! The French Pathé company took some time to respond to the introduction of optical sound-on-film for their semi-professional 17.5mm film size - partly because of major financial problems which forced a merger with Natan for the production and distribution of cinema film product. 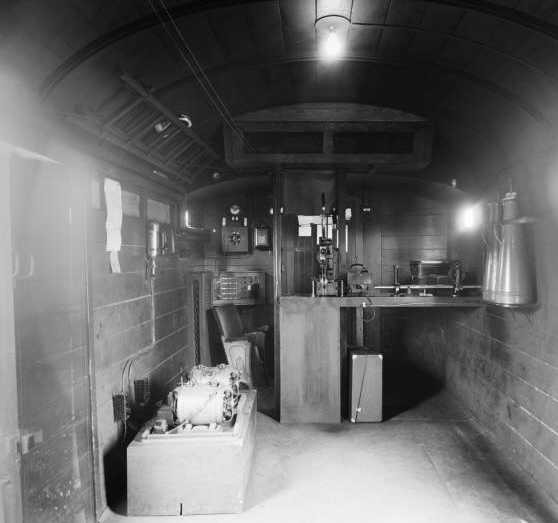 However by around 1933 a talkie 17.5mm machine was ready for installation in Pathé's smaller village cinemas. Known as the Pathé "Rural Sonore" - it was really just the silent machine modified for 24fps and fitted with an amplifier. 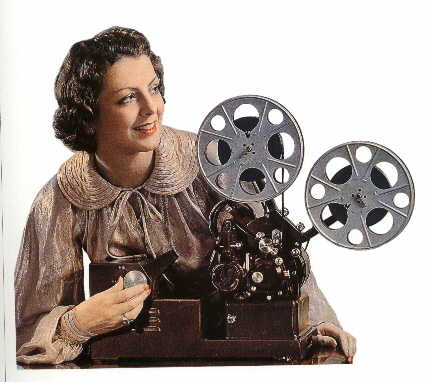 A program of over 300 feature films was soon available in 17.5mm sound which included most of the major French productions, some other European offerings and many American titles (e.g. L'Atlantide from G.B. Pabst; La Bandera from Duvivier; Les Perles de la Couronne from S. Guitry; La Kermesse Heroique from J. Feyder; Arènes Joyeuses; La Garnison Amoureuse and Marraine de Charley). These were completed by newsreels, animated films and documentaries. By the late 1930's Pathé boasted having 4823 cinemas in rural areas of France equiped with 17.5mm talkies, showing 54 million feet of film weekly. 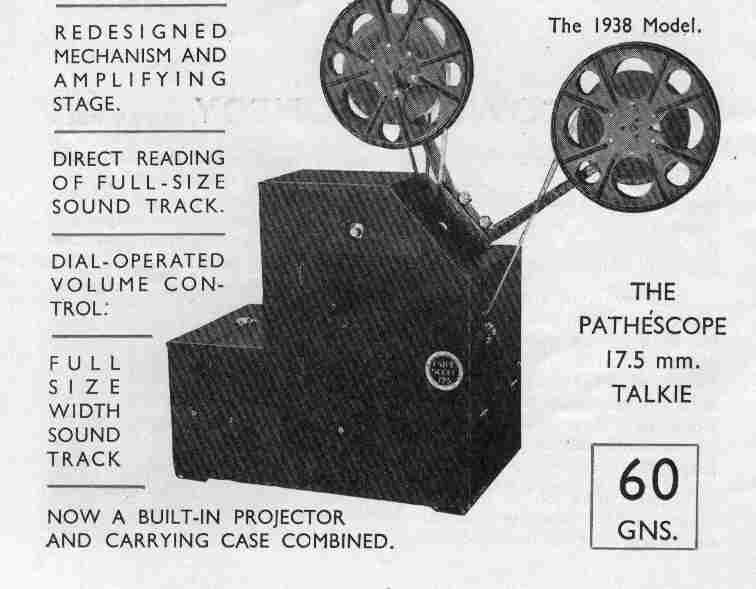 Probably because of a perceived demand from amateur movie enthusiasts, in 1933 Pathé also launched a smaller 17.5mm talkie projector for use by amateurs in the home or small halls, this was advertised as the Pathé "Natan 175" (we can see who was pulling the strings by this time at Pathé). Claimed to run at 16 and 24 frames / second and supplied with silent and sound gate masks, the initial model seems to have just been supplied with a built-in pre-amp for use with a suitable radio set or separate amplifier. Soon a version arrived with integral amplifier. The Pathé "Natan 175" design was not really satisfactory - the machine used very small offset film loops to a single sprocket - any loss of loop caused immediate film damage and the motor overun ensured many frames were damaged. The film was stabilised before the sound drum with a fixed chute meaning any splices etc. caused sound instabilty. Some light from the 16volt 8amp (128watt) projection lamp was diverted for the sound optics. The sound image was reflected by an external mirror onto the photocell. There was no electrical volume control fitted - sound level being varied by rotating a metal shield over the photocell casing - this was reported to cause distortion at lower sound levels. Maximum spool capacity was 1000 foot (about 22 minutes running time). In the UK, patents were filed for this design from September 1932 to May 1933. Pathé Pictures Ltd of Wardour Street, London commisioned STC (Standard Telephone Company) to build these machines in the UK. It was intended to use 17.5mm for a range of educational subjects from BIF (British Instructional Films). A continuous projection attachment was promised for advertising and promotional work. 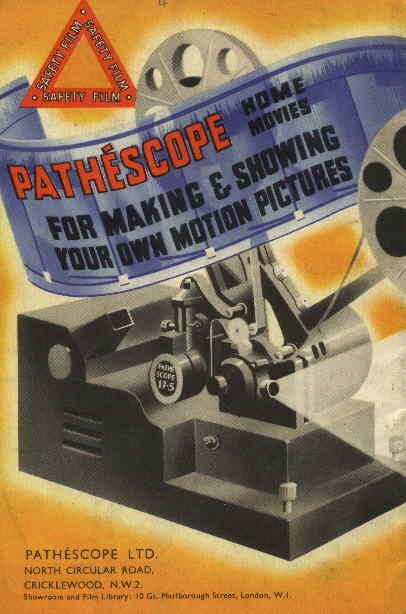 However 16mm was already taking hold as the standard semi-professional gauge and the 17.5mm machine was shunted over to the 'sub-standard' side of the Pathé organisation in the UK - Pathéscope Ltd. 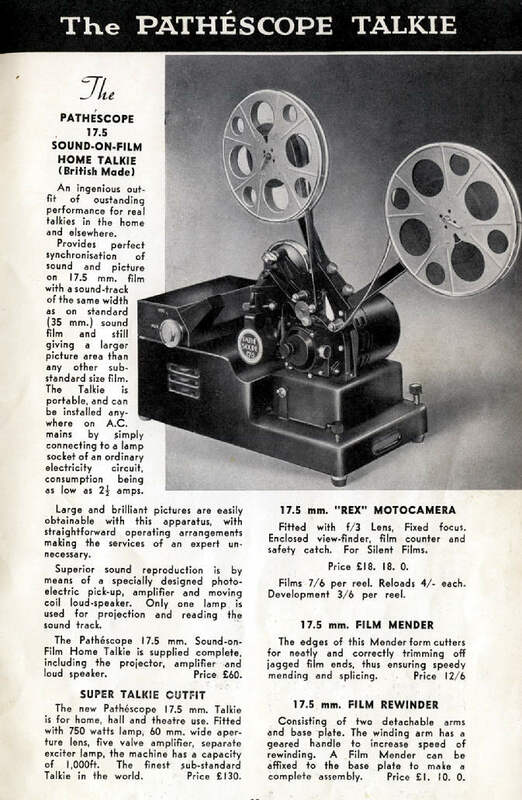 The April 1934 issue of "Home Movies & Home Talkies" magazine carried a two page article on the new Pathéscope 17.5mm "Home Talkie" - however from the illustration and the text it is obvious the journalists were shown the French machine, not the UK assembled model. The UK model which didn't actually appear till the Autumn of 1934, had an amplifier using R2 rectifier and 7A2 and 9A2 screened grid and pentode valves. There are some subtle differences between the original French design and the UK assembled model, which was designed for 110/210/230//250volt AC mains and had integral amplifer. It still used the French made picture head with 110 volt motor and even the 110 volt lamp transformer - the chunky (and heavy!) amplifier transformer also supplied the 110 volts for the motor and lamp transformer. 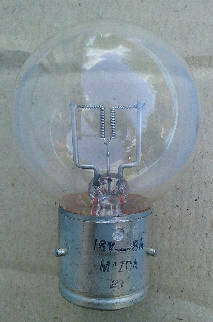 The amplifier body on the UK model appears longer and is cut away to clear the lamphouse. My example only runs at 24 frames /second and there is no mention of a silent speed in the UK instruction book. (I suspect that the French model was the same despite the 16/24fps mentioned in the French write-up I have). In "17.5mm Jottings" Martyn Stevens has highlighted other variations. 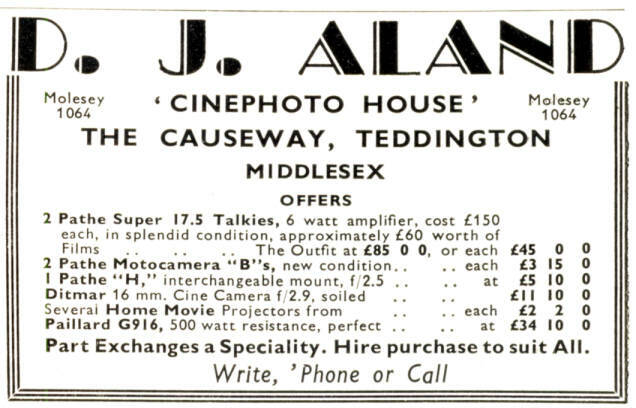 Originally the "Home Talkie" was sold with a 40mm projection lens, but in the March 1935 Pathéscope Monthly a longer throw 60mm lens was offered at an extra £5. 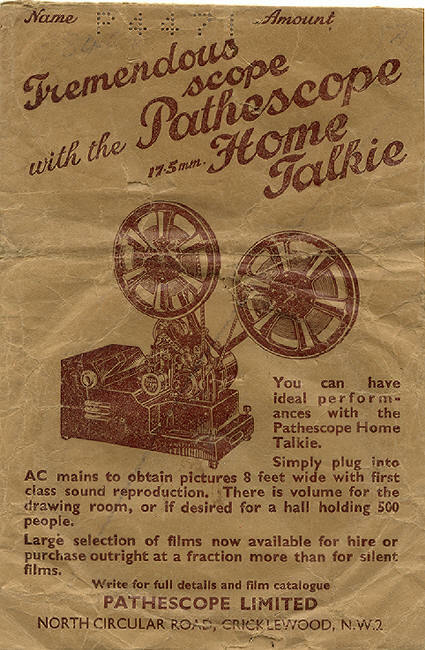 (The "Home Talkie" itself sold for £60 - good value at the time, but as the contemporary magazines suggested - "better as a 16mm machine"). 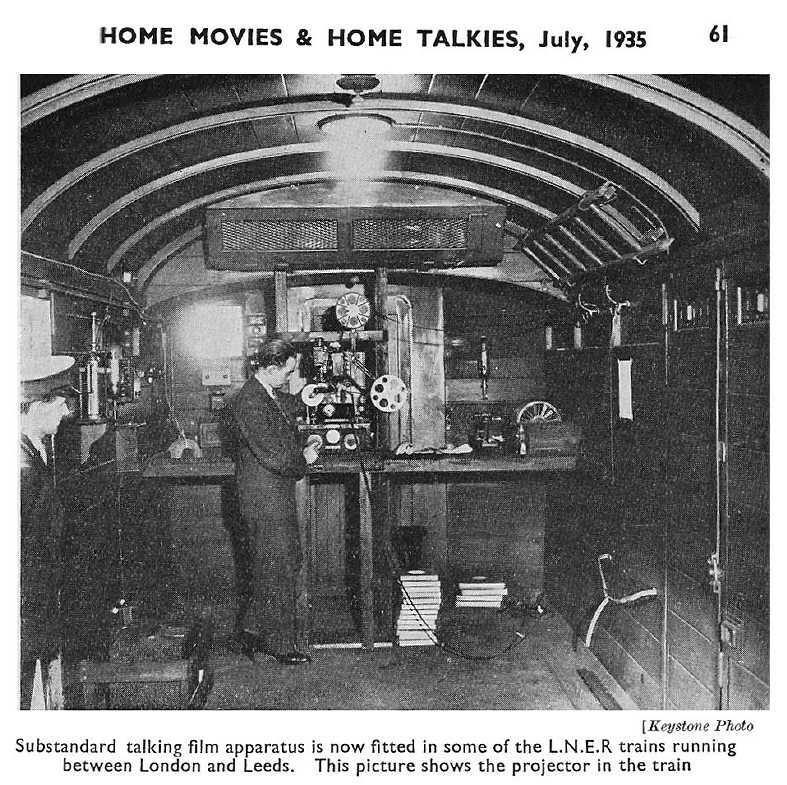 Presumably the Pathéscope "Home Talkie" was used for the travelling cinema in the Pathé Cinema Van which was in service on the London and North Eastern Railway express trains running between Kings Cross and Leeds. The travelling cinema was introduced in June 1935 and by December claimed to have travelled 63,300 miles giving programmes to over 16,000 people. 17.5MM FILMS ON THE TRAIN! Looks like the 17.5mm film prints stacked on the floor - just 1000ft / 300m prints, running time about 10 minutes each. We can see from the photo above that the film size used was definitely 17.5mm and the projector (probably specially imported from France) was the 17.5mm Pathé Rural Sonore - see higher up this page. The bit we can see is the projection box - no doubt the passenger seating accomodation behind the screen wall was rather better! Bit of a bumpy ride for the poor projectionist - I'd prefer the Odeon Leicteser Square! 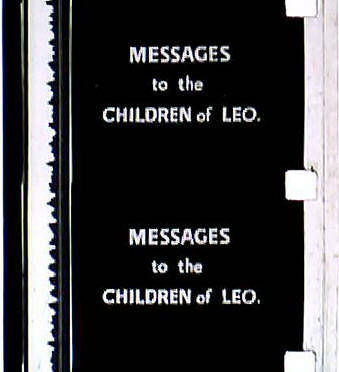 The film programmes seemed to have consisted of Pathetone and Pathe Pictorial short subjects - presumably arranged to tie-in with the time between stops. Nowadays all bus/coach/train/tram travellers just seem to want 'wifi' availability!! 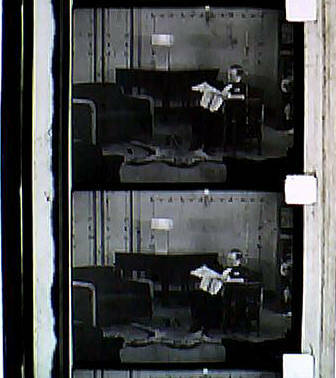 The original Pathé 17.5mm silent filmstock had perforations on both sides, one per frame. The perforation pitch is quoted as 9.5mm (this corresponds to various 17.5mm film samples I have here). Sadly in retrospect, the perforations were rather close to the film edge, meaning there was a higher chance of damage. Looking at the illustration below, we see that the maximum image size of Pathé 17.5mm was 9.5mm high x 13mm wide. As these sizes just intrude on the sprocket holes, the quoted 9mm x 12mm picture size would seem justified. As the standard cinema 35mm film shows a picture pitch of 18mm, Pathe could sensibly claim that their 17.5mm format was about half the size of 35mm. My Pathe 17.5mm 'Rex' cine camera has a gate size of approx. 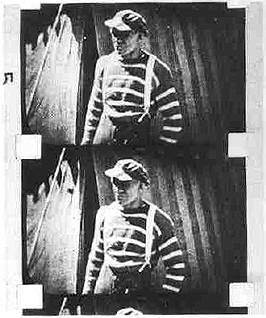 9.4mm x 12.8mm which would give the Pathe 17.5mm 'home movies' an image of that size, but looking at the image above, the silent films seem to have been printed with the picture as large as possible - probably the 9.5mm high x 13mm wide figure claimed elsewhere.. I notice they also include 16mm on this comparison - why didn't they just adopt 16mm as their standard? The reason is of course the word 'exclusivité' (as all French companies still quote!) - Pathé could patent their 17.5mm film gauge and keep all the profits to themselves as they had done with centre-start, lateral cut 78rpm records! 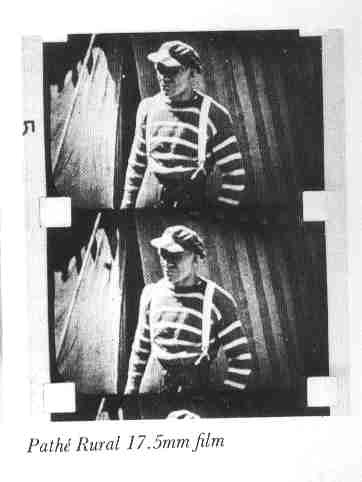 For Pathé 17.5mm sound the film image had been reduced slightly from the silent format and one row of perforations removed (like 16mm) to allow for the optical sound track. Here we begin to find variations in the claimed 'standards'. The sound picture gate aperture on my "Home Talkie" is approx. 8.5mm x 10.1mm. Pathéscope claimed the picture size was half 35mm (about right - 17.5mm is virtually half the pitch of 35mm) and the sound track was the same as 35mm. This was a bit of an exaggeration and track widths seem to vary a little. I have just quickly checked a 17.5mm Betty Boop cartoon and the variable density optical sound track seems to be about 2mm wide. 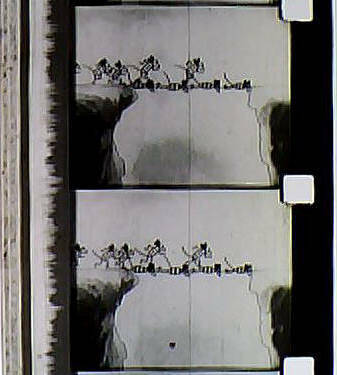 Another cartoon shows a variable area optical sound track about 2.5mm wide. The image sizes on the talkie prints are much narrower because of the sound track. On the example I have in front of me, the picture size seems to be 9.5mm high x 12.5mm wide. Except on the sound track side, the picture goes right up to the frame line and just out between the perforations. In addition the specification for picture to sound separation on 17.5mm sound prints seems to differ between France and the UK! On my UK assembled Home Talkie it appears to be about 26 frames, whilst on a French made 17.5mm Super Rural it appears to be around 19 frames. However it is marked on the leader of my UK 17.5mm print of "Sing As We Go" as 19 frames, and a French feature reel leader shows it clearly marked as 24 frames - exactly opposite! However in practice my UK and French 17.5mm optical sound prints seem to appear in reasonable sync. at around 24/26 frames! 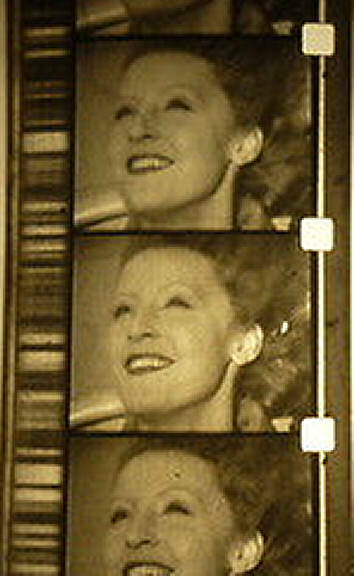 It is likely that later, UK Pathéscope 17.5mm printed films were prepared and printed in the UK by Pathéscope. In my garage I have one of the Pathéscope reduction printers used for preparing the master triple negatives (for 9.5mm ) and master double negatives (for 17.5mm) - I understood that this was originally the one used to produce the 17.5mm master double negative (on specially perforated 35mm) used for contact printing the film print copies. More about 17.5mm film specifications in Martyn Stevens' "17.5mm Jottings" - see the 17.5mm menu. In the April/May 1938 edition of the Pathéscope Monthly a new 17.5mm model of the "Home Talkie" was announced. Among the improvements claimed were a proper electronic volume control and sound-proofed projector case. I had assumed that the mock-up photo was all that ever appeared - in the same issue of the magazine 9.5mm optical sound was announced - sounding the death knoll for 17.5mm in the UK where it had made little headway against the world standard 16mm semi-professional gauge. 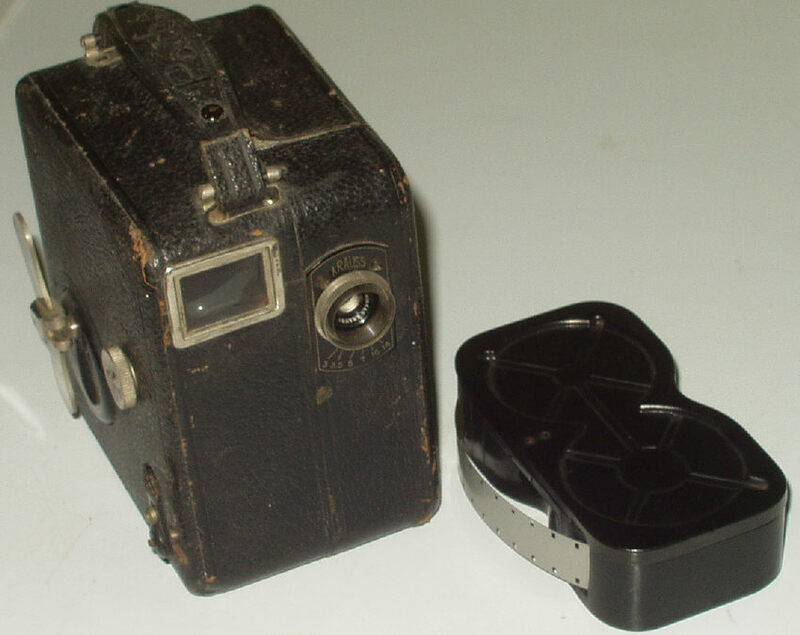 However at least a few examples of this 17.5mm improved "Home Talkie" (probably a UK development) were sold - a film friend's father actually bought one and used it for some years. 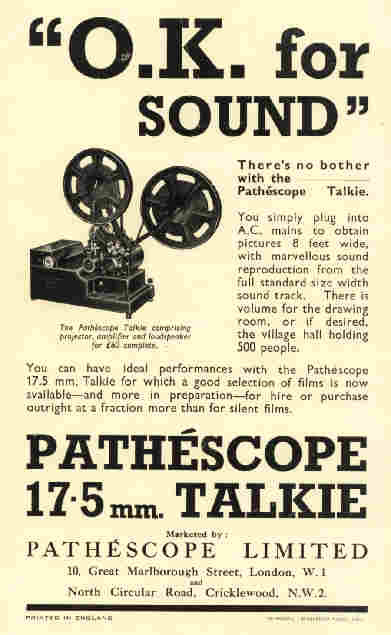 The writing was already on the wall for 17.5mm however, by the August/September 1938 issue of Pathéscope Monthly this machine was advertised as the Pathéscope 16mm sound-on-film "Super Talkie". No further mention was made of 17.5mm equipment in the magazine and during 1939 even 17.5mm film releases for the library stopped. 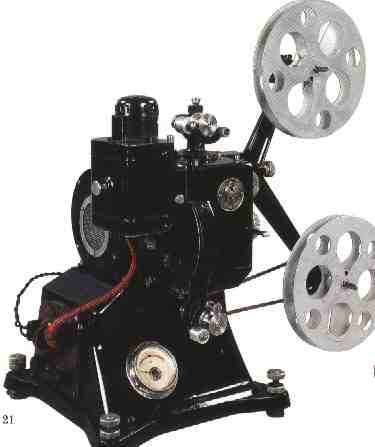 Fitted with updated sound and lighting, this is probably a good machine for showing 17.5mm films, if you can find one! (Check it is still a 17.5mm machine though, those that do survive are often converted to 16mm!) The Super Rural does still turn up in France but tends to be getting a bit pricey these days. 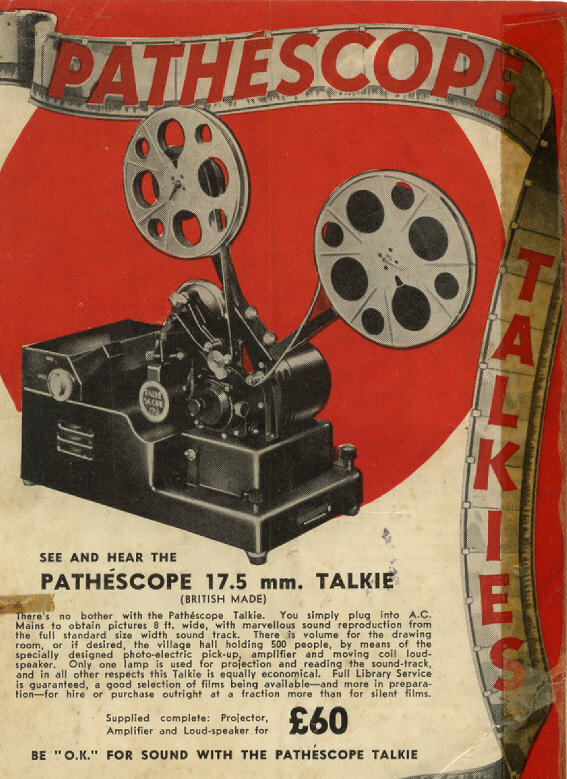 We see from the advert above, that the 17.5mm Pathé 'Super Talkie' was definitely sold in the UK. Looks like that this dealer had a couple he had trouble selling - two machines and a stock of films, a bargain at only £85 for the lot! These machines had only just been introduced in the UK! In the UK the last mention of 17.5mm equipment was in the 1938 Pathéscope catalogue and April/May 1938 Pathéscope Monthly magazine. 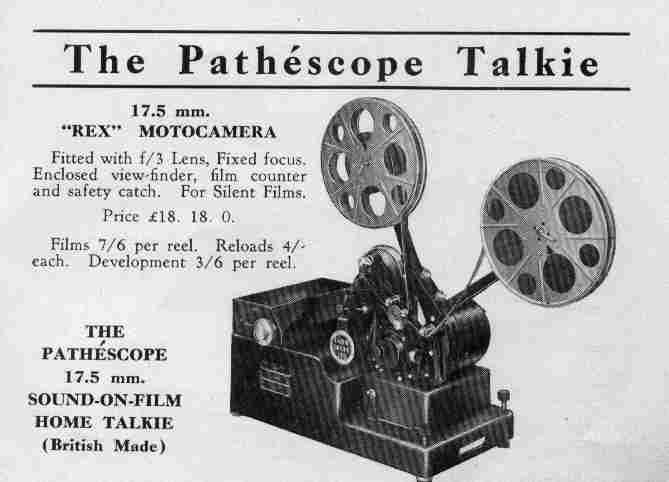 Soon after in the August/September 1938 Pathéscope Monthly the "Super Talkie" projector was re-advertised as a 16mm machine. 17.5mm library films were still announced in the magazine but evidently just 17.5mm prints of 9.5mm sound releases. The last library release "The Green Pack" was announced in April 1939. No further mention of 17.5mm was made by Pathéscope - soon after their 17.5mm film library was sold off to Illustra Enterprises of Wardour Street. It is said that after the war Pathéscope offered conversions of the 17.5mm "Home Talkie" to 16mm. In France, Pathé continued running their 17.5mm equiped "Rural" cinemas until 1940 when the German Nazi's invaded France. Finding 17.5mm non-standard (at least to the Germans) the occupying authorities decided to ban the film size. Pathé were allowed to circulate their current 17.5mm sound film programmes, then all film prints were ordered to be destroyed and most of the projectors were scrapped or converted to 16mm. According to French friends some equipment and films were hidden away, usually buried in gardens, but whether all this contraband was actually dug-up safely after the war remains a mystery! Certainly limited 17.5mm equipment and films do still turn up in France. 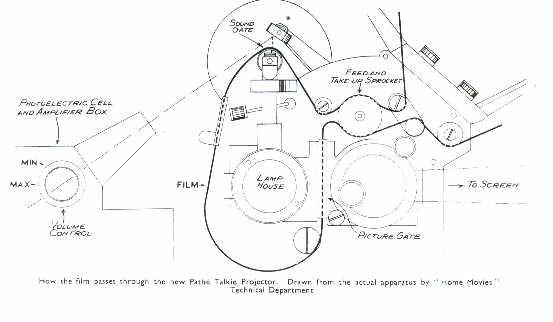 "The Home Cinema - Classic Home Movie Projectors 1922-1940" - Gerald McKee - pages 67-70. "The Amateur Cinema" 1977 - Val Randall - pages 14-15.